Photo by Rocío Lara on Flickr and used here with Creative Commons license. This post originally appeared on Through the Cracks: Crowdfunding in Journalism. Kickstarter plays a central role in the crowdfunding universe, but it is not the sun. The crowd is the sun. Kickstarter is a big planet in a solar system full of other planets. "Crowdfunding is about more than money." Pew Research Center released a study last week that on its surface might appear to be a summary of the state of crowdfunding in journalism. It is not. It’s the state of crowdfunding in the Journalism category on Kickstarter. Look at crowdfunding journalism on Kickstarter and you see things a certain way. Look at crowdfunding journalism on Kickstarter and platforms around the world and the results are very different. What follows is a glance at that bigger picture that Through the Cracks, a website that attempts to monitor platforms around the world, was created to capture. We beat this drum pretty often. It’s an important fact to remember. Three crowdfunding campaigns to create news startups that exceeded $1 million raised (De Correspondent in 2013, Krautreporter in 2014 and El Español in 2015) either created their own crowdfunding tool or, in the case of El Español, used a locally made platform. Here’s what those three campaigns had in common. Take a quick look at money raised on platforms like Seed&Spark, Beacon, Byline, Patreon and the now defunct Contributoria, and you’ll find some great, community-driven journalism with funding well into the six figures or more. Same goes for Indiegogo. Vague estimations is sort of the best you’ll get because unlike Kickstarter, most platforms do not publicly share their data. Then there are other platforms that focus on region, nationality, language, religion or common interests that have the occasional big-money success story. Micropayment services like Blendle and the Chrome plugin Tipsy as well as equity crowdfunding may play a bigger role in the future. The Journalism category on Kickstarter raised about $1.6 million to support more than 160 projects in first nine months of 2015. That’s important work, but it looks smaller when compared to other projects, categories or platforms. As the Pew report points out and Through the Cracks highlighted a year ago, the journalism category is one of the poorest performers on all of Kickstarter. It has the lowest number of successfully funded projects and the second-lowest amount of money of any Kickstarter category behind crafts. Hong Kong-based news startups FactWire and Hong Kong Free Press raised more than $500,000 to get off the ground. Using a Spanish platform, El Español in Spain sold equity to raise €3.5 million and create a news startup, the largest campaign to create a news startup to date. Positive News in London used Crowdfunder UK to sell equity and raise more than £250,000 to create a global media collective. The Santa Rosa Press Democrat and Redwood Credit Union joined forces this summer to raised more than $500,000 for the Lake County Fire Relief Fund. Fact-checking operations in Argentina, Italy, the United States and England used a variety of platforms to raise near $100,000. The Blank Spot Project in Sweden raised €122,000, part of what Krautreporter called a movement happening in Europe. Stundin in Iceland raised more than €45,000 on the website KarolinaFund.com. Taken together, this handful of standout campaigns from 2015 exceed the total $6.3 million raised all time in the journalism category on Kickstarter. Beyond these big money campaigns, several campaigns were carried out on platforms in other countries and in other languages that outweigh the average amount raised by a Kickstarter campaign in the Journalism category. 4. What is journalism anyway? Pew makes this clear, but their analysis of the Journalism category does not include publishing, photography, documentary or podcast categories because, like every platform, Kickstarter chooses how to categorize campaigns, and lets users choose where to publish their campaign. Check these categories and you’ll find six-figure campaigns for photo books, documentaries and podcasts. The Pew report definitely features new information that can help advance the work of established, independent and citizen journalists around the world. It’s worth the read, but it shouldn’t be considered comprehensive for all crowdfunded projects. 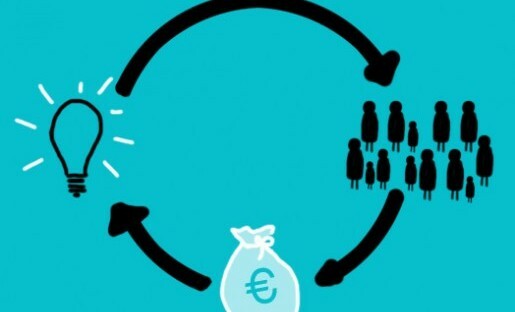 Crowdfunding is about more than money. It’s a tool that can be used as a bridge to other funding models. Look at De Correspondent and North Korea News’ transition to the membership model. It can be used to test community interest in a product (editorial or otherwise), to build community, and of course to bring underreported stories to light. That’s why Through the Cracks monitors platforms around the world. We follow these campaigns because it’s an ongoing experiment to enable reporters and sustain journalism. We share the results because by doing so we may pass on information that lets another media entrepreneur, freelance photographer or anybody else to make storytelling happen. We follow developments in this field because this is no fad. As Millennial entrepreneurs continue to freelance, build brands and gain influence, as social media and connectedness grow worldwide, as other funding options lose their luster and newspapers go into a tailspin, crowdfunding will continue to be an important tool. Khari Johnson is founder and editor of Through the Cracks: Crowdfunding in Journalism. He has built news startups for the last decade. I Proposed this years ago to numerous sobbing directionless Journalism sites . Paywalls are stifling old media news sources trying to keep up with digital media. Sad to say Bezos (old? new?) is offering to paywall The Washington Post, it dribbles non subscribers a few “reads” a month. I would drop a fiver for some of the well written well documented stories I have read. I had to build my own site to drill down to many stories on the web to dig out what really happened in situations that might not fit the talking points of the day..